Welcome to the Village Apartments, the "Gems of Bequia"
Village Apartments are conveniently located in Belmont overlooking scenic Admiralty Bay with its bustling yacht harbour. The one and two bedroom cottages and apartments gently cascade down the hillside just above the bay affording the units sea or garden views. All units are self-contained and comfortably furnished. Steps take you to the nearby Belmont Walkway, along the waters edge, to swimming beaches, dive shops and restaurants. 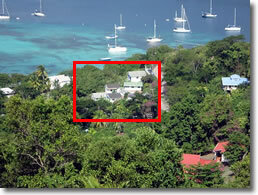 Many of our guests return year after year to their Bequia home at Village Apartments. We would also like to welcome the new visitor to our warm inviting island and our comfortable apartments so that you too may become one of the Village Apartment's family. Owners George and Val Whitney reside on site and are always happily available to help you with island information, arranging excursions and recommendations. Village Apartments offers free WiFi for their guests as well as use of ocean kayaks if you wish to paddle around the bay. Cable television and metered air conditioning is available in all units as well. Come join us and discover why Bequia is considered the crown jewel in the necklace of islands called the Grenadines and why Village Apartments are "The Gems of Bequia"!